Some 2,000 Bluetooth Low Energy (BLE) beacons have been installed across London’s Gatwick Airport to provide an indoor navigation system and an augmented reality wayfinding service so that passengers can be shown directions in the camera view of their mobile device. The beacon system is also open to retailers and other third parties, allowing them to detect the proximity of consumers and send relevant offers or promotional messages to their smartphones if the passenger has chosen to receive them. “The lack of satellite signals makes road-based navigation systems such as Google or Apple maps unreliable indoors, so Gatwick has deployed a beacon-based positioning system to enable reliable ‘blue dot’ on indoor maps, which in time can be used within a range of mobile airport, airline or third party apps,” the airport says. 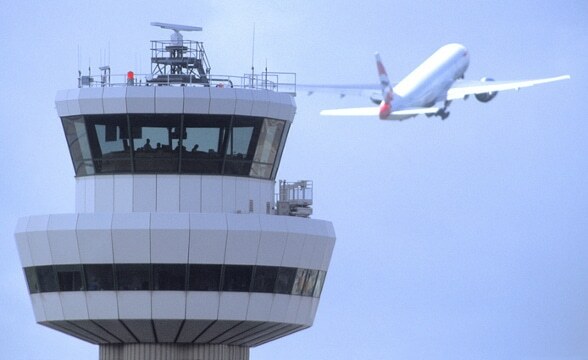 “The new navigation technology is currently being integrated into some of the Gatwick apps and the airport is also in discussion with airlines to enable the indoor positioning and wayfinding tools to also feature on their app services,” the airport adds. “No personal data will be collected by Gatwick, although generic information on ‘people densities’ in different beacon zones may help to improve airport operations including queue measurement, streamlining passenger flows and reducing congestion. “By providing the infrastructure, we’re opening the door for a wide range of tech savvy airport providers — including our airlines and retailers — to launch new real-time services that can help passengers find their way around the airport, avoid missing flights or receive timely offers that might save them money,” says Abhi Chacko, head of IT commercial and innovation at Gatwick Airport. The ‘blue dot’ navigation system is being powered by technology provider PointrLabs.